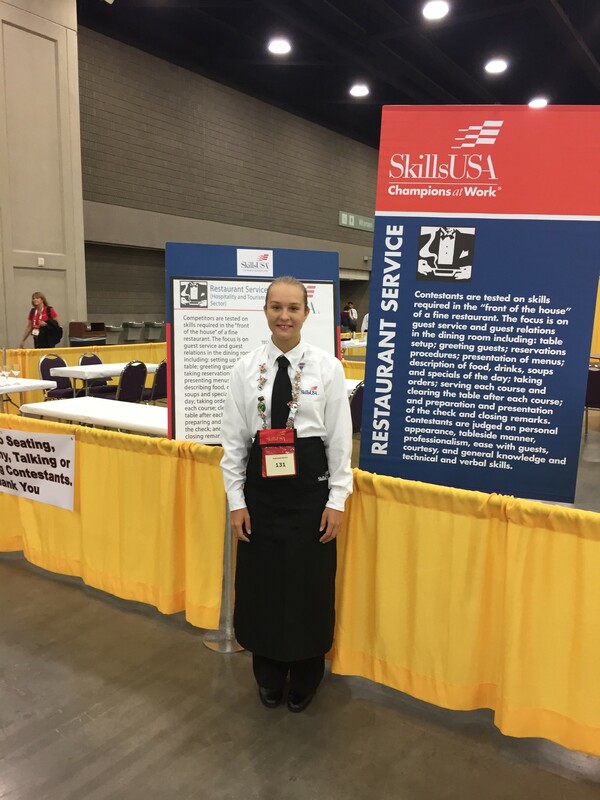 [Leesburg, Va., July 18, 2018] Haley Robison, of Branch Area Careers Center, Coldwater, MI recently participated in the SkillsUSA Championships. This event, by invitation only, was for first place state medalists in 102 competition areas for career and technical students. It is the largest skill competition in the world. Haley was a competitor in the Restaurant Service competition and won 3rd place in the nation. The SkillsUSA Championships, held in Louisville, Ky., took place June 27-28, 2018, as part of the SkillsUSA 54th annual National Leadership and Skills Conference (NLSC), a showcase of career and technical education students. During the week, more than 6,300 outstanding career and technical education students (all state contest winners) competed hands-on in 102 different trade, technical and leadership fields. Haley will be a senior at the Branch Area Careers Center. We are very proud of Haley and her accomplishments and dedication, said Kristen Dogan, Haley’s advisor at BACC. She and the other students that participated in the Restaurant Service competition are true champions in their dedication to excellence in their trade and their leadership skills. During the national competition, Haley and other students worked against the clock and each other, proving their expertise in occupations like electronics, computer-aided drafting, precision machining, medical assisting and culinary arts. All contests are run with the help of industry, trade associations, and labor organizations, and test competencies are set by industry. In addition, leadership contestants demonstrated their skills, which included extemporaneous speaking and conducting meetings by parliamentary procedure. Top student winners received gold, silver and bronze medallions. Haley also received scholarships totaling over $25,000 to the nation’s top hospitality schools. High scorers in the contests received Skill Point Certificates. The Skill Point Certificate was awarded in 72 occupational and leadership areas to students who achieved a high score defined by industry. The SkillsUSA Championships have been a premier event since 1967. 1965 and endorsed by the U.S. Department of Education, the association serves more than 360,000-member students and instructors each year in middle schools, high schools and colleges. This diverse talent pipeline covers 130 trade, technical and skilled service occupations, the majority STEM-related. More than 600 corporations, trade associations, businesses and labor unions actively support SkillsUSA at the national level. SkillsUSA programs are integrated into career and technical education through a framework of personal, workplace and technical skills grounded in academics. Local, state and national championships, designed and judged by industry, set relevant standards for career and technical education and provide needed recognition to its students. SkillsUSA also offers technical skill assessments and other workplace credentials. For more information, go to: www.SkillsUSA.org.